No one died in the blaze. 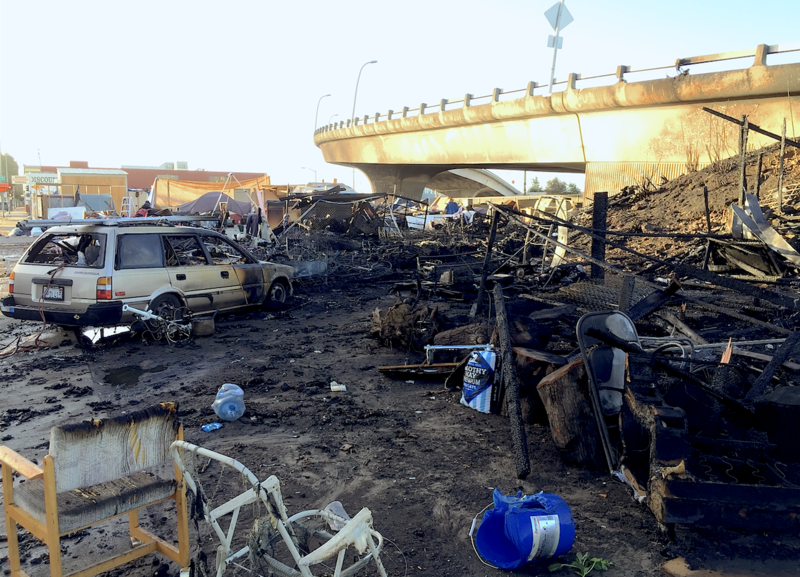 The fire destroyed numerous tents, cabins, and at least one vehicle. 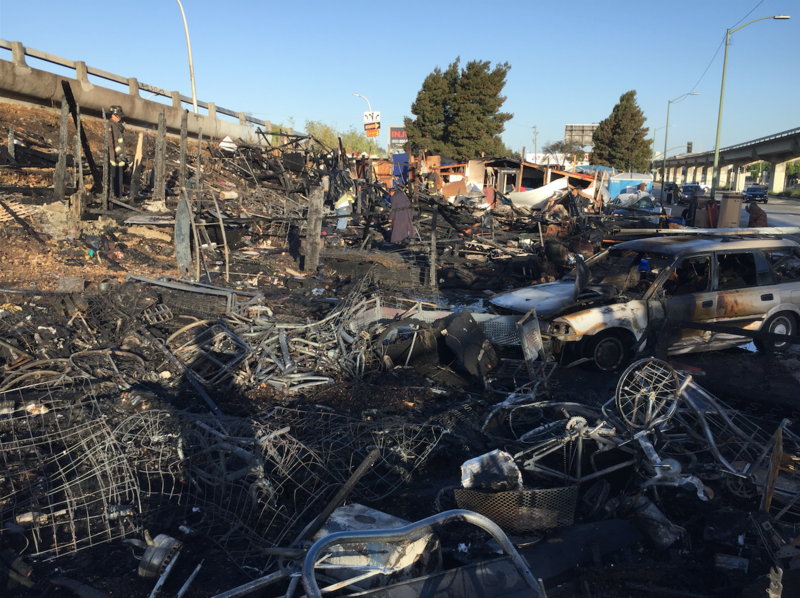 A fire destroyed the shelters of about 37 homeless Oakland residents early Tuesday morning. Fire inspectors on scene said it's unclear what started the blaze, which consumed about one-third of the camp. Distraught people picked through the debris looking for valuables as firefighters returned to extinguish hot spots at about 7:30 a.m. The blaze began at around 4 in the morning. No one was injured or died in the fire but a deceased person was discovered in a nearby tent afterward. An OFD inspector on scene said the death appeared to be unrelated to the incident, and the coroner's bureau is working to establish a cause of death. The Village, one of Oakland's largest homeless encampments, was first established in January of 2017 as an intentional community meant to decriminalize homelessness and occupy public land. First located in North Oakland's Grove Shafter Park, the group relocated to 2300 San Leandro Street after the city closed the North Oakland location down. The property is owned by the California Department of Transportation, and The Village has been notified by the state agency and city that they will have to move again in November because CalTrans intends to use the empty lot as a staging area for a bridge construction project. 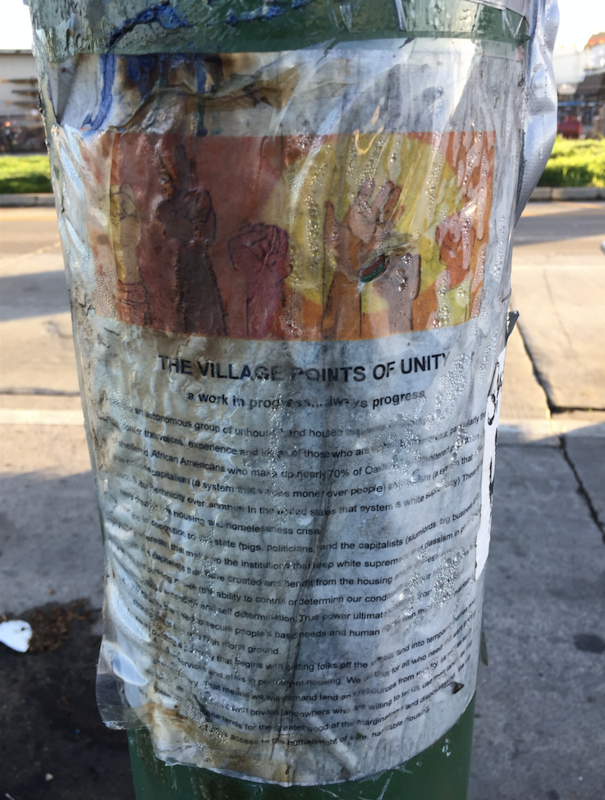 The Village's "points of unity" poster on a light pole at the camp was melted by the fire. Needa Bee, an organizer with The Village, said that so far, the group hasn't located a new plot of land and that the city is no longer working with them on finding a new location. Several smaller homeless camps along E. 12th Street and San Leandro Street between Lake Merritt and the Fruitvale have been closed down by the city over the past year. Bee said that many of the people from these camps moved into the Village, creating a situation of overcrowding. The Oakland City Council's Life Enrichment Committee is scheduled to discuss homeless camps at a hearing later today.